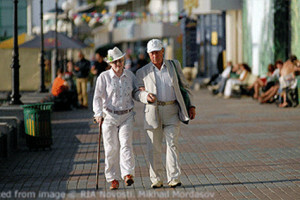 Last year Russia’s elderly took center stage. With the pension fund dwindling, the government passed legislation raising retirement ages from 60 to 65 for men and 55 to 60 for women that came into force this year. The move sparked mass protests as Russians worried about having to work for longer while facing the country’s low life expectancy rates – 68 years for men and 78 for women – and meager pensions: 14,144 rubles ($219) per month on average. Nursing homes, though, come with their own troubles. New residents can experience a loss of autonomy as simple choices like what to eat or wear are now delegated to someone else. In large nursing homes – which can house as many as 1,000 people – social workers often don’t know residents’ names.